A traditional Chinese technique promises to 'refresh' the eyes and improve comfort. The procedure is usually done by a roadside barber who will rub a medicinal liquid with a metal blade at the rim of the eye. Ophthalmologist Qu Chao explained that the practice treats sebaceous or oily glands on the eyelids. "Patients will feel that their eyes are dry and uncomfortable when the meibomian glands are blocked. When he is 'shaving', it is most likely that he is 'shaving' the meibomian glands. He will also do some eye massaging to make the patients feel comfortable," she said. 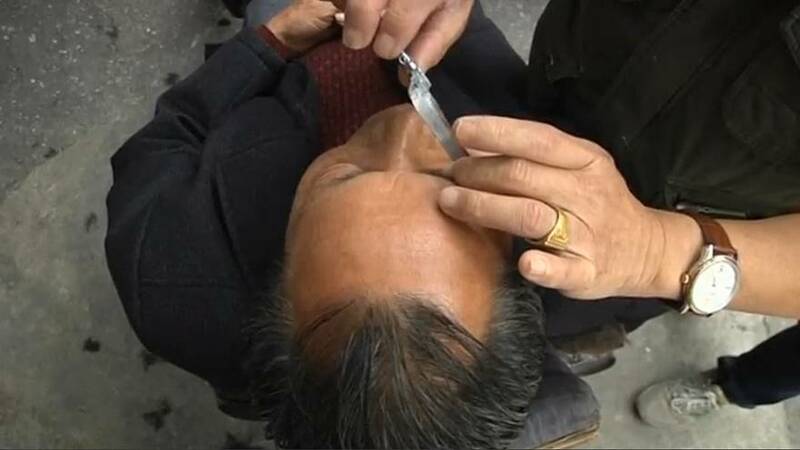 Sixty-two-year-old roadside barber Xiong Gaowu is one of the few practitioners and owns a stand in Chengdu, the capital of China's southwestern province of Sichuan. He will treat eight customers per week charging 80 yuan (10 euros) per treatment. His customers usually opt to shave their eyes after a haircut. "I was afraid of it at the beginning, I didn't feel confident. After more and more of practice, I became bolder. It was difficult at the beginning, but it became a piece of cake afterwards. Very easy," he said. Most of the people undergoing the 'eye shaving' procedure are of an older generation and have been treating their eyes in such a manner for decades. However, Dr. Chao warned of the risk of infection if the equipment isn't properly sterilised. "This [procedure] could spread diseases, and that is its fatal flaw," she stressed.